A Collection of Self Tie Adjustable Bow Ties is Coming Soon! If you love classic Self Tie Bow Ties, we have great news! We are currently working on our new collection of self tie bow ties. 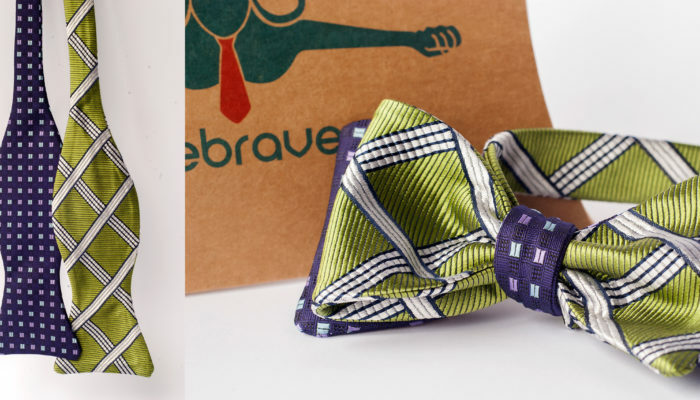 They are unisex, one off, adjustable and as all other Bebrave Textiles fashion accessories they are handmade from upcycled vintage neckties. Another great feature is that they are double side, so by buying one bow tie you get two unique patterns. Wear it with your favorite shirt or on a bare neck like a necklace! Did you know that the bow tie is almost five hundred years old and was first worn by Croatian warriors to keep their shirt collars closed. Off course, it didn’t look like a bow tie back then and was more like a scarf. It was soon adopted by French upper class citizens under the name of cravat and became very popular in 18th and 19th centuries. The cravats evolved into today’s neckwear and became bow ties and neckties. According to National Bow Tie Day, a bow tie is “an accessory that excludes great class and sophistication. Men who wear bow ties are perceived not to be afraid to step out of their comfort zone. The perfect bow tie for your outfit can instantly transform an otherwise dull outfit to something that oozes confidence and quirkiness. A bow tie can make you unleash the James Bond in you”. The self tie bow tie is also known as the freestyle bow tie and need to be tied manually. Different than pre-tied bow tie, it is not perfectly symetric, so it adds uniqueness and “organic” look to any of your clothing ensemble. Bow ties are also adorned by women. It instantly creates a look of fashionable and stylish person!